Okay. This week (yesterday, in fact), we in the Northern Hemisphere saw summer officially arrive. Some of us have been feeling it for weeks. Months, even. But it’s finally here, and I’m glad to welcome it. Something about the sun puts a smile on my face. Nothing about pollen does, but we take the good with the bad. And speaking of the bad, that brings me to my inspirational quote of the week. It’s been a rough week for me. I swear I caught some kind of plague. It made work rough; I usually give my employers 5,000 words a day (minimum) Monday through Friday. I fell short of word count all week and missed a soft deadline by one day. Something I’ve never done in my life. As it so happens, the work was completed before it was needed, anyway. The soft deadline was more of an estimate than a hard line. Maybe I can count my record as still intact. My mother-in-law had it rougher. She had just ended physical therapy from a life-threatening illness she contracted last autumn. She battled really hard to regain her memories, her hand-eye coordination, her ability to walk. Her only problem was a small balance issue, and everyone was certain she’d get that back, too. Then she had an accident—fell and broke what we thought was her hip. Turned out to be her femur. It required surgery to put a rod in to repair the bone. Now she’s back in in-patient rehab. Clearly my issue is far less serious than hers. But I bring up these situations because we have something in common. 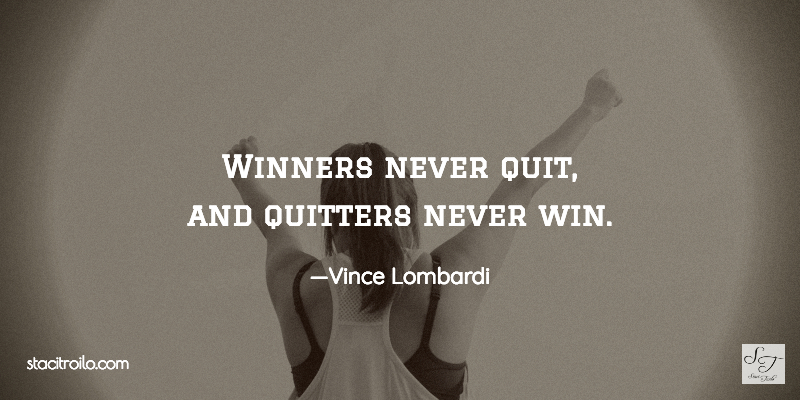 We aren’t quitters. I wanted to do nothing but sleep through this stupid cold or flu or whatever it is I have. But I had family obligations and work obligations. And I managed to get them done. During my mother-in-law’s earlier illness, doctors didn’t think she’d survive. She did. They didn’t think she’d get her mental acuity back. She did. They said she’d never walk again. She did. And I’m convinced she’ll recover from this, too. Wouldn’t surprise me if she made it to the beach this summer. When we’re faced with adversity, we have two options: fight or flight. I choose fight. What about you? You and your MIL are true inspirations! Hope you’re both on the mend. 5K words/day just blows me away, Staci. Thanks, Teri. My MIL is remarkable. Holy cow, 5,000 words a day?! Don’t get down on yourself because you missed the counts; heck, you’re sick, and we all know the ol’ brain slows down when we’re sick. That’s to remind us to rest in order to get better faster (hint 😉 ) May you get well soon, and kudos to your MIL for overcoming. She’ll make it through the broken leg healing process with flying colors, I’m sure! Aw, thank you, Julie. I think I’m finally over the worst of this bug, and my MIL is working hard to get back on her feet. There’s even talk of a beach vacation in the near future, so I’m sure she’s going to make a full recovery. Aw, thank you, Gwen. Hearing those words lifts my spirits more than you know. Thank you. I didn’t realize you were feeling under the weather on top of everything else. I hope it departs soon. Your MIL is an amazing woman with all she has recovered from, and I know she’ll fight her way back from her injury. Your quote today is so perfect for both of you. And I’m with Judi on your word count—you continue to amaze me! Thanks for the kind words. I’ll pass them along (when I can actually talk again). Very inspiring, Staci. I hope your MIL gets better soon. Thanks, John. I’ll pass the good wishes her way. Thank you. I sent a prayer already. Aw, thank you. We all appreciate that. So, so much. 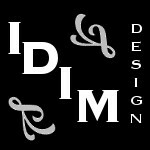 Wow, a great blog and LOTS of great links. My grandson and his girlfriend both caught whatever you’ve been struggling with–said it’s been miserable, but they plugged along, too. I can’t believe your word count for each day–5,000. That’s incredible! And thanks for so many good links. P.S. Good luck to your mother-in-law. Thanks for the kind words, Judi. I hope your grandson and his girlfriend are feeling better now. This thing seems to be lingering. I can’t wait to get back to normal. The sun and the pool are calling me! My daily word count isn’t as dramatic as you think. I worked up to it over the course of a year. (I aim to increase again soon, to 6K or possibly 7K.) Writing is my only job, and I write for several imprints, so I have to get a lot of words on the page daily. I’d miss my deadlines, otherwise. Thank God it’s a job I enjoy! Oh my! What a rough year for your family – mother-in-law and all. Hopefully, the healing and upswing continue. And thanks for the healing wishes. I’ll certainly pass them along. Great thoughts today. Sometimes the best we can do is keep swinging the hammer. I find this to be more productive than figuring out the next promo concept, sending tweets and posts into cyberspace or anything else. Swing the hammer, or put your fingers on the keyboard. There are some links I must check out too, thanks. Thanks, Craig. I love the hammer analogy. 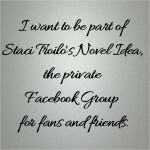 Check out this author inspiration and writing links from this post on Staci Troilo’s blog. Love the quote. Sorry about your mother-in-law, she sounds like a great woman. Thank you, Jina. She’s an amazing woman. I’m truly blessed to have her in my life. She’s strong; she’ll get through this. for you and yours as well. I appreciate the kind thoughts on her behalf, Harmony. Thank you. And thanks sharing the links! Happy Friday! Thanks, Annika. Your words encourage me. I’ll pass your wishes on to my MIL. I believe we’re all stronger than we think. We’ve got stores of resilience and strength in reserve—it’s just a matter of tapping into them. Yay for non-quitters! I’m reminded of a quote I once read; “as soldiers, our duty is not to avoid getting wounded. It is to return to the battle” (amazingly enough, it’s by St. John Chrysostomos referring to one’s war against sin). And many thanks for including my blog here! I have chills. That’s a powerful quote. Thanks for sharing it. He was famous his sermons. There is a tale of how he once found himself performing the mass in an empty church. Despite the lack of an audience, he felt inspired to deliver a sermon and did so. Unbeknownst to him, a Greek (meant, back then, to signify anyone believing in the twelve gods) was hiding behind a column ready to ridicule St. John. The sermon moved him so, however, that he jumped out from his hiding place and asked to be baptized. And I thought I had chills before. Words truly are powerful. Thanks for sharing—I’d never heard that.